Gizmo 3D has this week launched their new range of 3D printers over on the Indiegogo crowdfunding campaign website, looking to raise $95,000 over the next month to help take their new 3D printer concepts into manufacture. The Gizmo 3D 3D printing systems use SLA DLP technology and are capable of printing extremely fast reducing downtime and saving you money whilst allowing you to create detailed quality prints of your designs and projects. Watch the video below to learn more about the speed at which the Gizmo 3D printers is capable of building up printing layers using its top-down SLA DLP 3D printing technology. 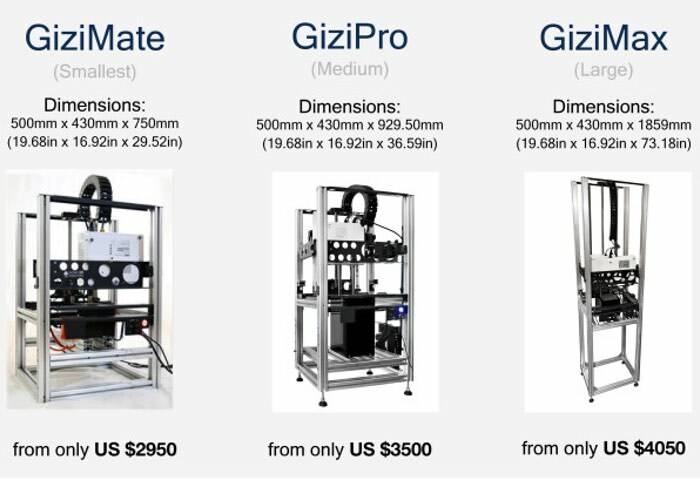 The Gizmo 3D printer range is made up of three different systems and sizes that take the form of the GiziMate, GiziPro and GiziMax as pictured above and range in rice from $2,950 up to $4,050. We don’t believe in dressing our machines up in fancy clothes. Instead, the Gizmo 3D printer is proud to show you what it’s made of – quality parts that scream reliability! One of the main reasons people get frustrated with other 3D printers is that they are constantly having to replace low quality parts. You won’t find this with the Gizmo 3D; our machines are built to last, and it shows. Our world famous super speed add-on (patent pending) fits on all 3 of our machines and allows you to print more than one item at a time at super speed. Unlike 3D printers with extruders that print only a section of a layer of the object at a time, our technology enables you to print the whole layer at once, giving you great results in record time. In addition, the add-on allows you to print numerous objects in the time it takes for other printers to process one. For more information on the new Gizmo 3D Printers jump over to the Indiegogo website for details.